CVS 159 Teat Knife, McLean for servering the Sphincter. Muscle. CVS 161 Teat Slitter with twin Blade. CVS 162 Barrett's papillatome for removal of growth from the duct of the cow teat. 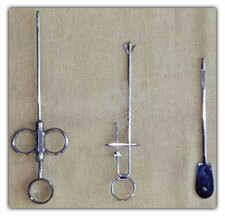 CVS 163 Teat instrument hudson's 2 size dilators and 1 introducer. 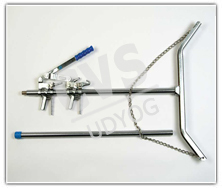 CVS 165 Teat Scissor with Slitting Blade. CVS 170 Teat Plug -Plastic. CVS 171 Teat Injection tubes for penicillin. CVS 172 15. Teat canula for penicillin. 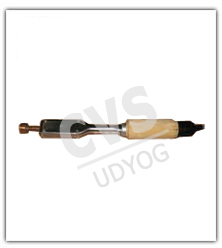 CVS 174 Milk Syphon self-retaining and adjustable. CVS 175 Teat memory set in a case containing 9 items. CVS 176 Rumentomy outfit cattle complete set.